Playing a guitar can be a stretch when you have smaller hands. For people with small hands, stretching to reach some of those chords is just too much of a strain. If this describes you, then it sounds like you need help finding a guitar with a smaller and thinner neck so that it’s an easier reach. You can find plenty of full-size guitars that come in a slimline or slimtaper neck design. Or, choose a smaller and more lightweight option like a 3/4 scale guitar. To help you find a good match for your hands, check out our reviews on small neck guitars below. Each of the models listed above are good options for an adult with small hands, as well as children and teens. An important thing to remember about 3/4 scale guitars is that their body is smaller in size than a normal full-bodied guitar. In fact, if you put them side-by-side then you will notice a definite size difference. To give an idea of the difference, a 3/4 scale Martin guitar is what pop star Ed Sheeran plays. Check out the image below for a visual representation of the size differences. But don’t let the smaller size of a 3/4 scale scare you away from one of these models. They are actually pretty great to play as they often weigh less than a full-body guitar and they often have just as good of sound. Though a lot of people use this size as a travel guitar, you can definitely make it your make instrument. But, if you’re opposed to that, you’ll find plenty of models in the list above that are full-size guitars with thinner necks that are easy for people with small hands to play. 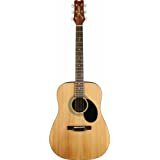 While some of the guitars listed above are cheaper than this one, I think that this Yamaha FG700S Acoustic Guitar is the best value guitar for small hands. 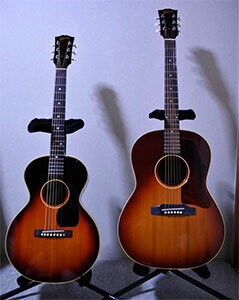 It is really a high quality acoustic guitar for the money. Of course, it should come as no surprise that Yamaha is making high quality instruments, right? This is actually a really good acoustic guitar for beginners too. This six-string might not be much of a beauty to look at, but it sure sounds good when you play it. It is acoustic, however the sound you get is a little on the folk side. But, if you’re a singer-songwriter then that will be just perfect for you. In the video below you can hear how the Yamaha FG700S Acoustic Guitar sounds when played. View New Model at Amazon! The guitar does not come with a gig bag, unless you end up buying the slightly higher priced bundle from Amazon. You can do that, and the gig bag is pretty decent, but I suggest that you order the guitar by itself instead of the bundle and then pick out your own bag for the guitar. In general, I think that most electric guitars are easier to play than acoustic ones when you have small hands. 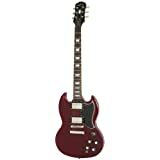 However, some of them are a lot easier than others and I’ve found that the Epiphone SG G-400 Pro Solid Body Electric Guitar is the best one for the money right now. In addition to the feel, I’m a big fan of the design of this one. It’s so old school rock star, right? That’s because Epiphone set out to make this electric guitar similar to the ones they were making back in the 1960’s, so it has a lot of that old school charm. And, that’s why this is an electric guitar with a small neck cause that’s they way they were making them back then. You think that such an awesome electric guitar would not be affordable, but you’re wrong. This is actually a really cheap electric guitar. Another cool thing about this electric guitar is that you get a lot of features for the money. It is priced so that it’s a good entry level electric guitar choice, but the features are way above most beginner models. The Alnico Classic PRO pickups and push/pull coil-tapping give you some amazing sound options. It’s hard to find a more versatile option at this price point. Plus, you’re getting one of the most well-known brands when it comes to guitars and musical instruments, and that means one thing – high quality. This slimtaper profile electric guitar is not only good for small hands, but it is built to last you for many years. And you’ll want to keep it because the sound you get from this is a thing of pure beauty. Even if you’re looking at this as a good electric guitar for beginners, I bet you’ll still be able to produce some amazing music with it. Out of the box, this guitar has D’Addario strings which feel great when you’re playing. The only down side to this guitar is that it doesn’t come with a gig bag or case. But, since it’s a full-size electric guitar, you can easily find one that you like and buy it separately. I want to give you an idea of the sound that you can expect from this awesome electric guitar. So, take a moment and watch the YouTube video below that I found online. It lets you hear what type of music you can make with this model. 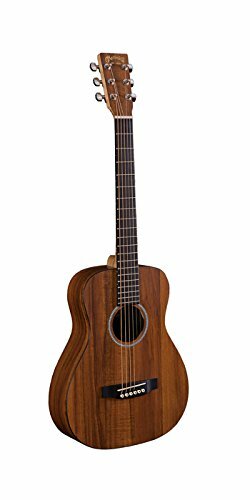 If you have small hands and want the best acoustic guitar for the money, then I strongly encourage you to look at the Taylor BT2 Baby Taylor Acoustic Guitar. This guitar is very similar to the regular Baby Taylor, except this is an upgraded model and it sounds much better. The Taylor Baby Taylor 2 is a 3/4 scale guitar, or what you might normally think of as a travel guitar. However, this guitar is high quality and sounds great, so you can easily make it your main guitar like many people do. The neck is thin and it’s easy to chord on it with smaller hands. You don’t even have to stretch to reach the chords. This is a very affordable entry level acoustic guitar, which makes it good for beginners – even if your hands aren’t small! This steel string guitar is very easy to play and not too painful on the fingertips. In fact, you’ll notice that the strings actually feel very light. That’s a nice feature for beginners who might not have those fingertip callouses built up yet! Since this guitar is designed to be traveled with, it comes with a free padded gig bag for storing and transporting the guitar. This is a nice feature since it can be hard to find good cases and bags for 3/4 scale guitars. 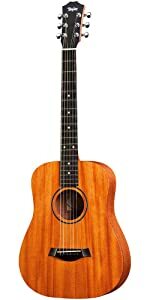 This solid wood guitar is a very high quality instrument that is designed to last you through many years of playing. It is made to withstand all types of weather – hot, cold, humid, rainy – and still maintain it’s tuning. And it definitely does, based on my experience! But probably the best feature of the Taylor Baby Taylor 2 guitar is the sound that you get from it. I swear it sounds just as good – if not better – than a regular full-body guitar! But you don’t have to take my word for – just listen to how great it sounds in the video below. 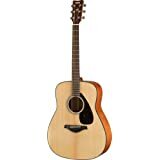 If you’re not really interested in the smaller travel guitar size for your playing, then I suggest that you take a look at the Takamine GD20-NS Dreadnought Acoustic Guitar. It’s a really beautiful guitar that sounds good. Plus, it has a great low price. I’m a big fan of the way this guitar looks. It blends some different wood tones to give this classic body style a nice makeover. The top is solid cedar but the sides and back are mahogany. 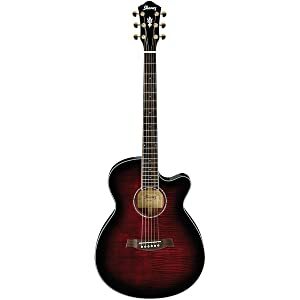 And you’ve got the normal rosewood fretboard with the Takamine GD20-NS Dreadnought Acoustic Guitar. All this comes together to give you a nice warm tone from the guitar when you strum it. It sounds really good and works well for all different styles of music. To determine if this is best guitar for your music needs, take moment to listen to the sound you get in the video below. It’s a good representation of what you can expect from this model. If you’re looking for the most versatile type of guitar, then a good acoustic electric model like this Ibanez AEG240 Thinline Recording Acoustic-Electric Guitar is the way to go. It’s like getting the best of both worlds but you only have to buy one guitar to do it. I’m a big fan of Ibanez guitar because you can get a full-size guitar with a slimmer neck because almost all of their guitars have a slimmer neck. And the Ibanez brand is known for making high quality guitars at affordable prices. One of the really cool things about the Ibanez AEG240 Thinline Recording Acoustic-Electric Guitar is that it has a built-in USB port. That means you can directly connect it to your computer when you’re ready to record. Now that is pretty awesome. This guitar is one of their thinline models, which means that it’s not as big and deep as a regular model, which makes it easier to hold and play for people with smaller hands and shorts arms. So, if you are petite, keep in mind that this is a good guitar for short people with arms that might not be able to easily make it around a standard fully body guitar. If you buy this Ibanez guitar, you’ll also need to buy a separate hard case or gig bag cause it does not come with one. I think that’s a good thing though cause it means that you get to pick the case or bag that you like the most, and you can base it on how you’ll be treating the guitar. I mean, if you’re not going to be traveling with it then you probably don’t need a hard case and a soft gig bag would be better. 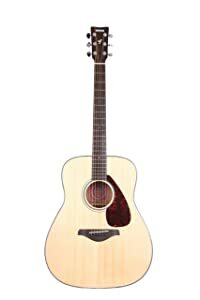 Like all Ibanez guitar, you get some great sound from this awesome acoustic-electric guitar. Take some time to watch the video below and you can see exactly how this guitar sounds when it is played. I bet you’ll agree that it has a great sound. If you want a good acoustic-electric guitar under $300, then you need to check out the Epiphone PR-5E Acoustic-Electric Guitar. 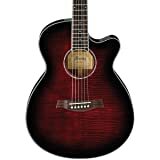 Like the Ibanez above, this model is good for people with small hands who want the versatility of an acoustic-electric. Right now, it’s the best value acoustic-electric guitar on the market because it offers a lot of features and high quality for the money. I really love the design of this guitar’s body with the single “Florentine” or sharp cutaway there at the top. It has sort of a retro feel to it and it just looks cool. Of course, what matters is how it sounds! Well, the design and wood used gives it a bit of a sweet tone. You’ve got a spruce top, a hand-scalloped, proprietary X-bracing pattern, mahogany sides, and a slightly arched mahogany back. That’s how you get that sweet tone even when you don’t have it plugged in. But let me tell you, this guitar sounds even better plugged in thanks to the eSonic2 preamp with NanoFlex pickup that it features. It’s like the guitar comes alive cause the sound is pretty great. 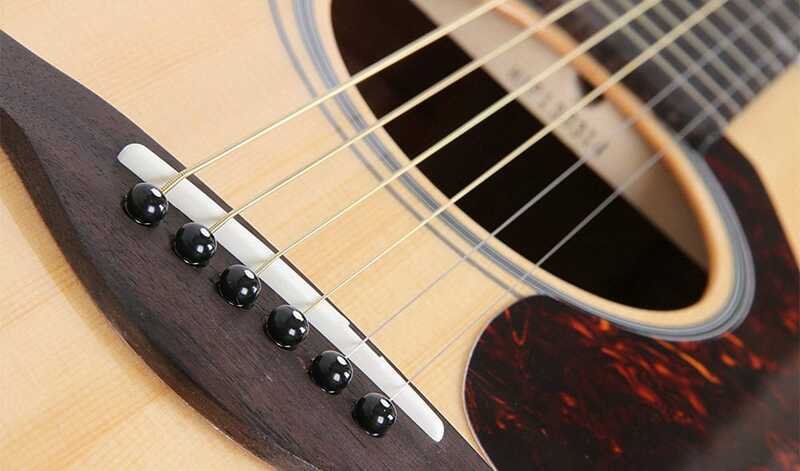 As an acoustic entry-level guitar, this model really ranks high with us. Overall, it’s a really great guitar with a very affordable low price. And the sound is awesome at this price point. We suggest you take a moment to hear for yourself in the video below. If you are interested in learning how to play the acoustic guitar, you are in luck. These days, there are more learning opportunities than ever and one of these small body guitars is the perfect instrument to learn on. Traditionally, learning guitar meant taking lessons from someone in your local community. This is still an option today. You can find a private teacher located nearby to give you one-on-one instruction. The benefit of going this route is that you have someone available who can watch your hands and tell you how to improve your technique. Unfortunately, in-person lessons also have some downsides. For one thing, they can be expensive. Additionally, you have to drive across town to get to your lesson, making it somewhat of a hassle. You also may not have a lot of flexibility in terms of when you can schedule your lessons. Another option is to take lessons online. You can either work with an instructor through a video service such as Skype or Google Hangouts, or you can sign up for a pre-recorded video lesson series that you can watch at your own pace. Both choices have the advantage of not requiring you to leave your home. If you work with an instructor through the Internet, you will still have to find a convenient time for both of you to schedule your lessons. However, you still get all of the benefits of having a teacher with far fewer hassles. If you choose the last option of working with a pre-recorded video lesson series, you have the most flexibility in terms of your learning schedule. You can work at your own pace and can spend as much time as necessary on each lesson until you master the technique. Of course, the downside to these types of lessons is that you don’t have direct contact with the instructor. As a result, they won’t be able to analyze your technique to make sure that you are doing everything correctly. But the big upside here is that many instructors have free lessons online on YouTube that you can check out anytime. And there is a lot of variety in terms of the lessons available. For instance, check out the one we found below. As you can see, there are many different ways that you can go about learning to play acoustic guitar. With so many options available, there is no reason to wait to get started. Simply decide which technique you want to use to learn and sign up for lessons. Before you know it, you will be playing guitar like a pro, impressing all of your friends with your talent. Once you set your mind to it, it is amazing how quickly you can learn a new instrument with the right lessons guiding you.